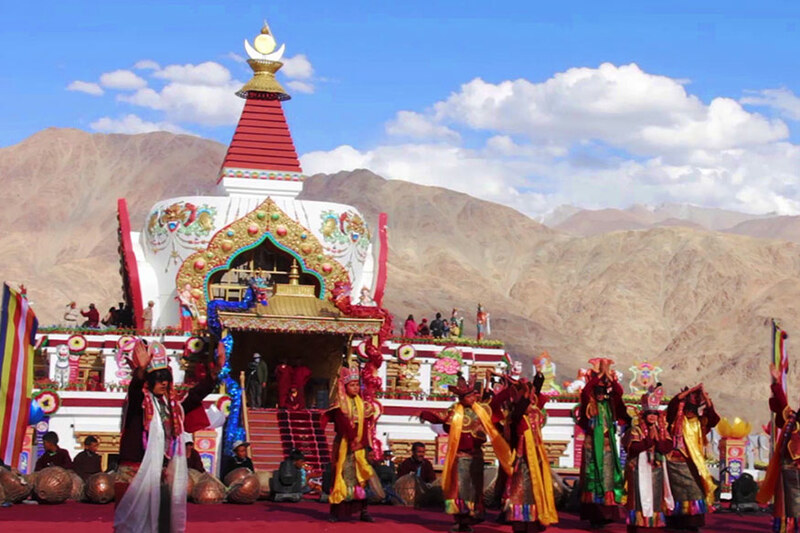 Otherwise calm Hemis, on the outskirts of Leh, is witnessing the presence of thousands of people from across the Himalayas to celebrate the life of Buddhist philosopher and scholar Naropa in their tradition ways with singing and cultural events. The Naropa Festival, celebrating 1,000 plus years of the life of Naropa — who lived between 1016 to 1100 CE — also witnessed the formal inauguration of Naropa fellowship for post-graduates and 'next generation leaders' on Sunday. The Hemis — a Buddhist Monestry, situated 45 km from Leh — welcomed followers of Drupka Lineage from India, Tibet, and other parts of the world. This year's celebration of the festival, famous as the Himalayan Kumbh, is a "special case". Speaking at the opening ceremony, Khamtak Rinpoche, the chairperson of the organising committee, said that the festival hoped to "showcase the rich and divine heritage of the Himalayan region". "Naropa Festival takes places every 12 years in the Tibetan calendar, the last celebration was organised in year 2016 for the completion of 1,000 years of Naropa legacy, this year it is organised as a special case as many of our devotees could not attend and seek the blessings of the Naropa in 2016," he said. "The next few days will bring great spiritual benefits to all of you, as we have arranged special teachings, cultural programs...and we will organise Bollywood concerts. "The main idea behind this is to give an opportunity to all young and talented artists to share the platform with the best artists of the country. I hope this will instill confidence in our upcoming artists. And open window of opportunity to connect them with the best people of the Bollywood," he said. Naropa at the age of 25 became a monk in Buddhist studies, eventually joining the faculty of the great Nalanda University where he became one of the four principals. He traveled as far as Kashmir and Zanskar and spent many years in this region, Rinpoche said. During the day-long celebration, the first EDM album of Ladakh, "Return of the Stars", was launched with an aim to encourage the youths to explore their talents. The proceeds of the music CD will be donated to the Kerala relief fund. Apart from cultural programmes and performances from local artists and Bollywood Singer Kailash Kher, which were held till late on Sunday, the festival also saw formal opening of the Naropa Fellowship program. The one-years residential programme for post-graduate candidates plans to "encourage and shape the next generation of leaders in policy and entrepreneurship". The fellows will study under various visiting academics, industry experts and practitioners. Speaking to the media on the sidelines of the festival, Drukpa Thuksey Rinpoche said that the fellowship will also help people become acementally and physically stronger and better people". "We want them to be a good human being, by educating them we also want them to preserve the Himalayan culture which they will understand here. "The teachings will also include love and compassion. Instead of class lessons, the students wil get a chance to learn through examples and not just through class lessons," he added. Minister of Skill Development and Entrepreneurship Dharmendra Pradhan also sent his regards and message for the festival and the fellowship programme. "I believe this festival will bring forth the cultural vibrancy of the Himalayan region to the centre stage and expose the world to the rich cultural heritage of the Himalayan belt. The founding class of the programme commenced on September 1 with a strength of 50 Fellows. The five-day long festival will come to an end on Thursday.